3+ Effect Monsters Neither player can target this card with monster effects. Once per turn (Quick Effect): You can target 1 face-up monster on the field; it loses 500 ATK/DEF. Your opponent cannot activate cards or effects in response to this effect’s activation. At the start of the Damage Step, if this card attacks an opponent’s monster: You can place that opponent’s monster in a zone this card points to and take control of it, but send it to the GY during the End Phase of the next turn. Borreload Dragon is a fantastic Link Monster and powerhouse every deck that Link Summons wants to run. Great stats and support behind it, you’ll need 3 monsters at least for this Link 4. Self-protection against monster effects helps against quick answers to this cards summoning. Two arrows on the corners lit up gives you two spots to go for your Extra Deck. Once per turn ATK/DEF drop quick effect of an opponents monster gives you control over dropping a stronger monster immediately and eliminating it, or waiting until the Damage Step to step in and save a monster from destruction. Your opponent can’t counter this effect, which may be even more important. No Solemn Strike to this dragon. If that wasn’t good enough, this card gets a Goyo Guardian effect. Attack an opponents monster, place it in one of the zones lit by this card instead of destroying it, and have it until the End Phase of the next turn. Instead of doing damage you can steal a monster and attack with it, then do whatever with it. You should never lose out on the monster you steal. While the only effect protected internally by Borreload Dragon is its ATK/DEF drop Quick-Effect, this card is overpowering. This is a good cover card. Borreload Dragon is a Link-4 Dark Dragon-type Link Monster with 3000 Atk and L, BL, BR, and R Arrows. Those are great stats. The main downside is the requirement to Link Summon is 3 or more effect monsters. That’s steep but not impossible. While on the field, it can’t be targeted by monster effects. Protection is always on a boss monster. The quick effect is protected from reaction. It allows you to drain 500 Atk and Def. You can still stack effects onto a chain, but your opponent cannot. Finally, Borreload Dragon also steals monsters it declares an attack on. The monster must occupy a space this card points to, and the stolen monster goes to the grave during the End Phase. However, there is no once pet turn restriction on this, so if Borreload Dragon has multiple attacks, it will be able to steal multiple monsters. There is definitely some OTK potential here and it’s generic, so any deck that can Link Summon should try to keep this ace in the whole. One of my personal favorite Link Monsters in the game, along with Linkuriboh and Crystron Needlefiber (both OCG only at the moment, but bound to change) and the cover card of Circuit Break is the #7 for this week. I thought Topologic Bomber Dragon would be the rival ace in Vrains, but it seems Borreload Dragon is taking that spot instead. Borreload Dragon is a Link-4 with arrows pointing Left, Right, Bottom Left, and Bottom Right and requires at least 3 Effect Monsters. The summoning condition isn’t too restrictive, but you cannot use two Link-2 monsters or a Link-3 and something else like the protagonist ace, Firewall Dragon. Borreload cannot be targeted by monster effects, which is always nice to have any sort of protection. Once per turn (Quick Effect), you can target a monster on the field and make it lose 500 ATK and DEF forever. This is meant to trigger the Rokket monsters, but weakening opponent monsters is great as well. It is nice that your opponent cannot respond to this effect, so if they couldn’t Strike the summon, they cannot Strike on you weakening a monster. At the start of the damage step, if Borreload attacks a monster, you can take control of the monster into a zone that this card points to, but it is sent to the GY during the End Phase of the next turn. This is cool, as you can gain material for a Synchro, XYZ, or Link Summon off of this, or just get rid of a problem card your opponent has. This is a great Link Monster that will likely see play in some Extra Decks as a big monster that opens up the Extra Deck as well as helping you out problem monsters. Borreload Dragon (Bor-Reload is that the pronunciation here?) is a beefy Monster. 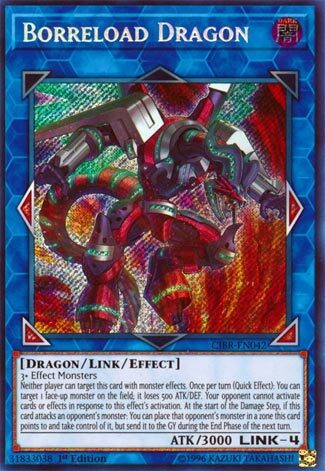 Link 4, Dark, Dragon, with 3000 attack and requiring three or more effect Monsters to be created. The arrows here point to its left and right, and diagonal bottom left and right. What does he do? A LOT. He can’t be targeted by Monster effects from either player. He can target a Monster on the Field, who then loses 500 attack and defense (which may not be necessary, except for extra Damage as he has 3000 attack of his own). Finally, at the start of the Damage Step, he can gain control of a Monster he attacks, by placing it in a Zone this card points to, and said Monster goes to the Graveyard at the End Phase. Of course you’re going to use that Monster for something before it goes away…a Tribute, an XYZ or a Synchro, something to further your own advantage before it goes to the Graveyard. I expect we’ll see plenty of this card for a while.